Planning a new garden can be both fun and challenging if you do not know where to start. So, to help you, here is a list of some of the many styles of ponds available for your new garden. We’ll also include some tips on where each pond type fits best. Liner ponds typically come as flexible liners and pre-formed liners. A flexible pond liner is great for a free form pond or if you are adding a stream bed or water fall to the garden pond. Pre-formed pond liners are ideal for someone who has never built or had a pond before as they are more forgiving with what you try to do with them and are extremely durable, albeit more expensive. They usually come in a variety of shapes so you are sure to find the one that fits your design idea. If you have a small space, you can opt for a container water garden. These garden ponds can be created using plastic containers, ceramic pots, or water barrels. The varied styles and colors mean you can find one that fits your space. These are great to showcase on porches and decks. This is the most expensive construction type for ponds but they have high durability. However, there are two potential disadvantages, which are concrete ponds are difficult to install and often require a contractor to build them. •  Nature or wildlife pond: Built to encourage wildlife usage, there is very little equipment required to make them (think lined excavation and just add water). Since they are a pond for nature, they need to look the part with lots of plants to generate the oxygen necessary to keep them clean rather than relying on a pond filter or pond pump to do the work. •  Fountain pond: This pond is about movement and the sound of water. To create this effect, the pond must have a fountain pond pump. The water falling down actually helps to oxygenate the pond so not as many plants are necessary. •  Waterfall pond: These ponds are great if you have the room to create multiple layers to the pond so that the water falls down and creates an amazing sound. You will need to incorporate rocks and earth to build up the layers to generate the waterfall. If that’s too challenging, there are pre-formed waterfalls that can be added to the side of your pond that run on pond pumps that can create the same effect. 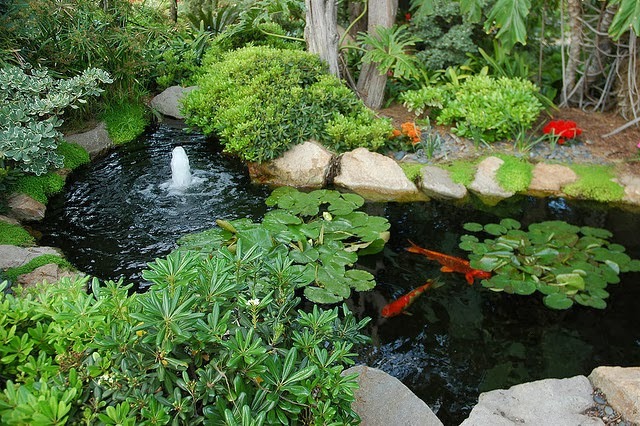 •  Fish ponds: Whether you choose goldfish, which are great for smaller ponds or Koi fish that thrive in more expansive ponds, this is a way to add color and interest to your pond as well as add more nature to the experience. The fish must have clean water so a pond filter system is very important. Also, no chemicals can be used to keep the water clean as this will harm the fish. Whatever pond style you choose, make sure it complements your garden’s size, scope, and components. You don’t want it to dominate the entire yard but integrate as though it was natural to see it there among your flowers and plants. If you are still not sure, there are many examples online of garden pond designs on sites like Pinterest as well as books and portfolios at garden and DIY stores. This blog post was written by Carly who loves lots of things, including gardening and walking her two doggies. Carly is writing on behalf of Swallow Aquatics who sell pond liners, pond filters and similar pond related paraphernalia!